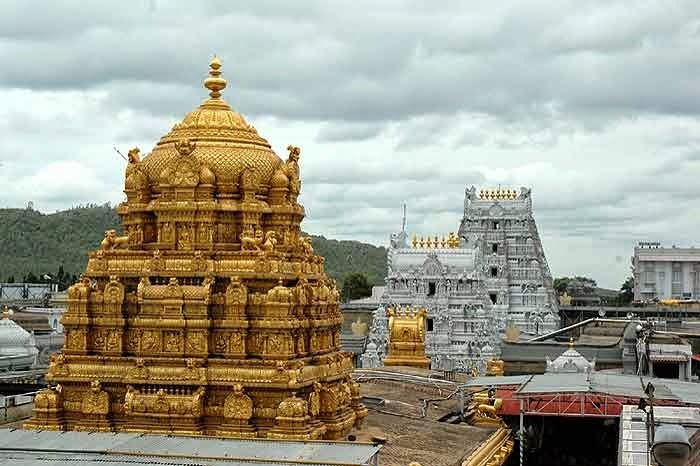 Tirumala Tirupathi is the place where the god Srinivasa or Venkateswara or Balaji is there. Tirumala Tirupati Devasthanam is an independent trust which manages the Tirumala Venkateswara Temple at Tirumala, Chittoor, Andhra Pradesh. Lord Venkateswara is placed at the top of seven hills. Lord Venkateswara is belived as Direct deity of Kali Yuga. Devotees will pray with shrada and bhakti god will remove all sins comitted by the devotees. Tirumala Tirupathi Devasthanam located at Andhra Pradesh and Karnataka border between the natural beauty of the hills. One of the country's 108 is therefore sacred Tirumala. One day rushi's had a doubt that who is the greatest in trinity (Brahma, Vishnu, Shiva). Rushi's decide Brugu Maharshi will test the trinity. Brugu Maharshi enters into vaikunta at that time Lord Vishnu is with Goddess Lakshmi Devi So, Lord Vishnu doesnot observe the Maharshi then he gets angry and he kicked the Lord Vishnu at the breast. Lord Vishnu came down at the foot of Maharshi and act to do seva then he pressed the eye at the middle of planter of the leg. After that Maharshi get enlightenment and he repent on the Lord Vishnu and ask moksha or salvation. Lord Vishnu said that go in to the earth and see me then you will get salvation. Brugu Maharshi came to tirumala and done penance. Every year on Magha shudda Padyami day celebrations will be done like Teppostvam, Giri visit, Puskarini utsav responsibilities will be done by the Government. If devotees will rotate the rounds through the hill Lord will fulfill there desires. The utsav will celebrated till three days and morethan one lakh people will visit at the time of bramostavam. Tirupathi Devastnam is earning 25 lakhs yearly in bramostavam time by the devotees offering their hair to Lord Venkateswara. In Sravana Maas four Saturdays special pooja will be done to the Lord Venkateswara. The mainpriest Shamacharya family was offering pooja since five generations.